Abbi Robert, left, serves up a craft beer to festival-goers Christine and Jim Rieser, of Upper Township. 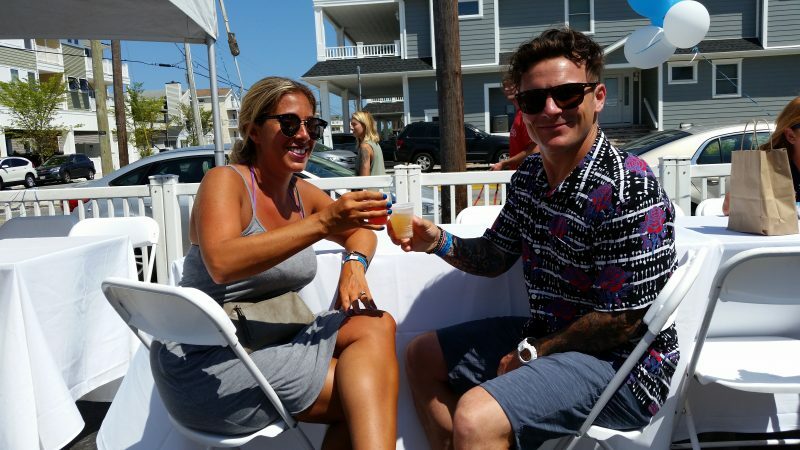 With tiny plastic cups in hand, Ernie and Andrea Barile made the rounds Saturday while sampling a series of craft beers that seemed a perfect way to quench their thirst on a sizzling July afternoon in Sea Isle City. Christine Rieser felt the same way. She and her husband, Jim, were planning to taste as many beers as they could while hunting for a favorite. “Do you mean to tell me there is a limit on how many we can try?” Christine Rieser said in mock indignation. 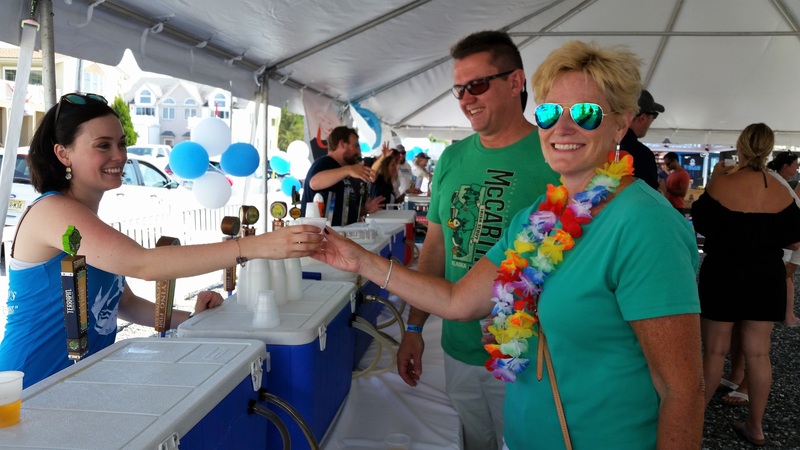 The Bariles, who have a summer home in Sea Isle, and the Riesers, of Upper Township, were among the craft beer aficionados attending the first ever Townsends Inlet Beer Festival on Saturday. The event showcased more than 40 types of craft beer from breweries in South Jersey. 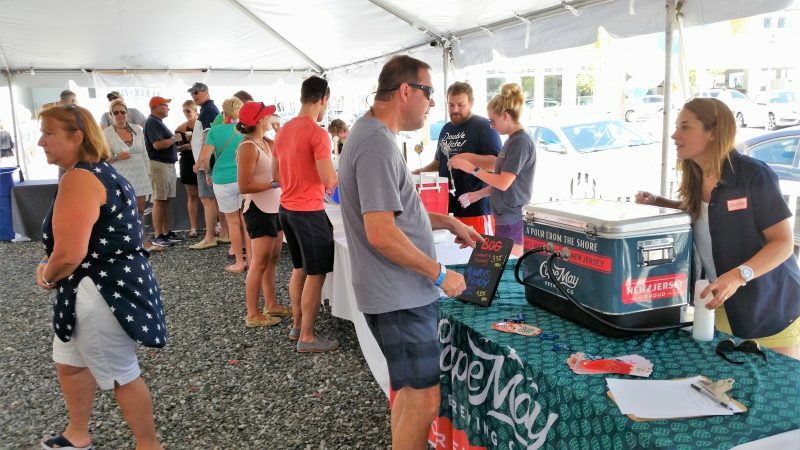 Some of the brands had a distinctively local name, including Ludlam Island Brewery, Cape May Brewing Co. and Tuckahoe Brewing Co.
More than 40 brands of craft beers from South Jersey breweries were on tap under a tent. 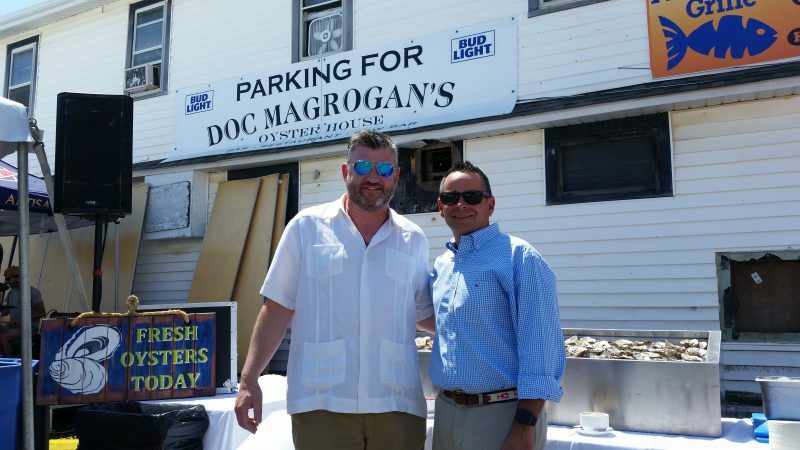 Doc Magrogan’s Oyster House, an upscale eatery in Townsends Inlet, sponsored the festival to draw more visitors to an area that is being revitalized with new retail and restaurant attractions. “This is another way to bridge the communities of Townsends Inlet, Sea Isle City and Avalon,” said Dave Magrogan, the restaurant’s owner. Organizers wanted to keep the craft beer festival small for its debut, so only 200 tickets were sold. It was held under a party-style tent in the parking lot for Doc’s Magrogan’s Oyster House at 87th Street and Landis Avenue. Doc Magrogan’s, which opened in 2016, is part of a sweeping makeover of the sleepy Townsends Inlet section in the past two years led by developers Christopher Glancey and Bob Morris. Sea Isle developer Christopher Glancey, left, and Doc Magrogan’s Oyster House owner Dave Magrogan held the festival to feature the new attractions in Townsends Inlet. New retail shops, restaurants, a food market and luxury condominiums are creating a new vibe along the Landis Avenue corridor between 85th and 87th streets. Glancey and Morris have built three new projects combining commercial space on the ground floor with condos on the top two stories. Dave Magrogan said the new development projects have blended in with the traditional neighborhoods of Townsends Inlet to make the area even more inviting to residents and visitors. “Townsends Inlet has such a great sense of community,” he said. Doc Magrogan’s Oyster House has benefited from the renewed interest in Townsends Inlet by drawing customers from throughout Sea Isle City and neighboring Avalon, Magrogan pointed out. “It’s been great. Phenomenal,” he said. Festival-goers Andrea and Ernie Barile, who have a summer home in Townsends Inlet, celebrate over sips of a craft beer. Ernie and Andrea Barile, who reside in Philadelphia, have had a chance to observe Townsends Inlet’s transformation from their summer home on 86th Street. They have lived in Townsends Inlet for three years and welcome the new attractions, such as the craft beer festival. Barile, 37, has been vacationing in Sea Isle with his family and friends since his high school days. Despite some of the changes in Townsends Inlet, he believes the area has not lost its old-fashioned charms or quiet reputation. “You still have the feel of a lazy shore town. It’s still the sleepy Townsends Inlet. But there’s also the bar and nightlife scene. You get both ends,” he said. 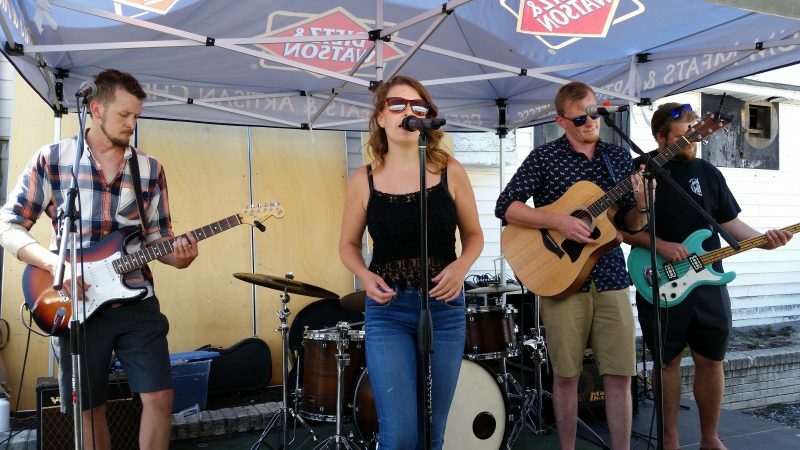 The band Devin Lyn & Whiskey Tango Foxtrot provides the entertainment at the beer festival.